We’re not deaf…we heard that stampede of Iron-Inundated Practitioners! Our recordings and clinical resources for improving your skill-set in all things iron including, your accuracy of diagnosing deficiencies, pseudo-deficiencies & excesses, plus radically rethinking the best treatment approaches for each scenario…have been some of our most popular. Because nailing iron (pardon the pun) is harder than we were all lead to believe and at least 1 ‘iron maiden’ or ‘iron man’ walks into our practice every day, right? So we’ve brought together 5 extremely popular UU30’s on Iron into one bundle for the price of 4! 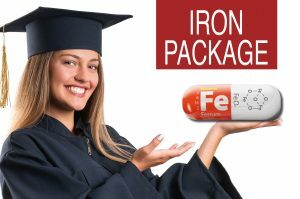 So if you’re more than ready to graduate from ‘iron school’, now’s your best chance! Overt Iron Deficiency Anaemia or Haemochromatosis aside…do you understand the critical insights markers like transferrin and its saturation reveal about your patients iron status? Most practitioners don’t and as a result give iron when they shouldn’t and fail to sometimes when they should. This audio complete with an amazing cheat sheet for interpreting your patients Iron Study results will sharpen your skills around iron assessment, enabling you to recognise the real story of your patients’ relationship with iron. The most common mistake made in the interpretation of Iron Studies is this one: confusing inflammation driven iron ‘hiding’ with a genuine iron deficiency. Worse still, following through and giving such a patient oral iron – when in fact it is at its most ‘toxic’ to them. This audio together with some key patient pathology examples will prevent you ever falling for this one! Learn how to recognise a ‘Pseudo Iron Deficiency’ in a heartbeat! We’re increasingly seeing high ferritin levels in our patients and getting more comfortable referring those patients for gene testing of the haemochromatosis mutations; but, do you know how to distinguish between high ferritin levels that are likely to be genetic and those that are not? This can save you and your patient time and money and there are some strong road signs you need to know. In addition to this, what could cause ferritin results in the hundreds if it’s not genetic nor inflammation? This Update in Under 30 summary will help you streamline your investigations and add a whole new dimension to understanding iron overload…but not as you know it! And then you don’t. The reality is we all struggle at times with correcting low ferritin or iron deficiency anaemia – so what have we got wrong? In spite of being the most common nutritional deficiency worldwide, the traditional treatment approaches to supplementation have been rudimentary, falling under the hit hard and heavy model e.g. 70mg TIDS, and are relatively unconvincing in terms of success. New research into iron homeostasis has revealed why these prescriptions are all wrong and what even us low-dosers need to do to get it more right, more often! Iron supplementation, regardless of brand, presents us with some major challenges: low efficacy, poor tolerability & high toxicity – in terms of oxidative stress, inflammation (local and systemic) and detrimental effects on patients’ microbiome. What should we look for to minimise these issues & enhance our patients’ chance of success. Which nutritional adjuvants are likely to turn a non-responder into a success story and how do we tailor the approach for each patient? It’s not what you’ve been taught nor is it what you think! This comes with a bonus clinical tool, a fabulous easy reference guide – to help you individualise your approach to iron deficiency and increase your likelihood of success. You’ll never look at iron studies or your iron-challenged patients the same way. Listen to these audios straight away in your online account. To purchase the Iron Package click here.